This "Blazin' Hot Smoked Beef" along with two other varieties which I'll review later, "Smoked Venison" and "Cherry Maple Flavored Smoked Turkey" were provided to me for review by Jedidiah's Jerky. Beef, brown sugar, sugar, salt, spices, crushed red pepper, onion, garlic, sodium erythorbate, sodium nitrite. The first thing I taste from the surface of these pieces is a moderate sweetness, followed by a moderate saltiness. I can also pick up a noticeable chile pepper flavor, and a light bit of burn building. The chewing flavor starts with a lot of meat flavors, and an increased saltiness. There's also a fair amount of garlic and onion. The burn builds up more. For being labeled as "Blazin' Hot Smoked Beef", I'd say there's enough heat in this to warrant the use of the word "Hot", though I'm not sure about calling it "Blazin' Hot". On my personal heat scale, I'd put this at a medium level (level 3 out of 5). But there's also an easily noticeable chile pepper flavor which seems to enhance the sensation of eating something hot. But the "Smoked" part of the name doesn't seem at all warranted. I don't get any smoky flavor from this. Otherwise, the flavor that seems to come out the most are the meat flavors. This has a cured meat flavor, as opposed to a steak flavor, more comparable to something you'd find in beef sausage. The garlic and onion flavoring is also quite noticeable, and even compete against the meat flavors pretty well. There's also a light black pepper aftertaste building up. The level of saltiness in this tends to increase as I go through these pieces, and feels to be at a medium to high level. The sweetness continues through the chewing and provides a light amount of body to the overall flavor. What you're going to notice in this is mostly the cured meat flavor, with a fair amount of chile pepper flavor, along with garlic and onion, a somewhat high saltiness, and a light bit of sweet. You'll also get a medium level of heat. These are slices of whole meat, sliced into thick, bite sized pieces. This is a semi-moist jerky, with a moist surface feel. These pieces feel pliable and flexibile, but will easily crack open and break apart with just a little bending. They're easy to chew and easy to eat. The chewing texture starts out feeling soft, moist, and tender. They don't provide any chewing resistance, and don't feel rubbery at all. They break down very quickly, and chew down to a soft mass pretty easily. At that point, it feels somewhat mushy, though still retaining the fibrous character of beef. I don't see any chunks of fat on these pieces, and found no gristle or tendon. I found no stringiness, and no unchewable wads of tissue. In terms of clean eating, my fingers pick up a light bit of moisture and oiliness, just enough to require a finger licking before touching my keyboard. Jedidiah's Jerky sells these Remington Trail Steaks Blazin' Hot Smoked Beef in a 2.88oz package for a price of $13.98 for two packages. Shipping is included in that price. That works out to a price of $2.43 per ounce. 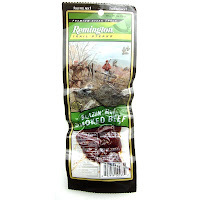 For general jerky snacking purposes, at the $2.43 per ounce price, it seems to present a decent value. I'm getting a fair amount of snackability due to an overall good flavor, though easy eating and decent chewing texture. 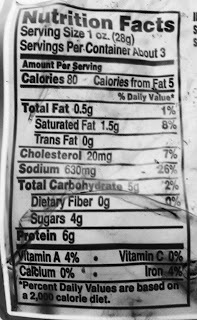 Compared to major brands of jerky found in grocery stores, it costs considerably more, though offers only a slightly better flavor and consistency. For being marketed as "Blazin' Hot Smoked Beef", at the same $2.43 price per ounce, it's a fair value. I get a medium level of heat, and a noticeable chile pepper flavor, though no smoky flavor at all. 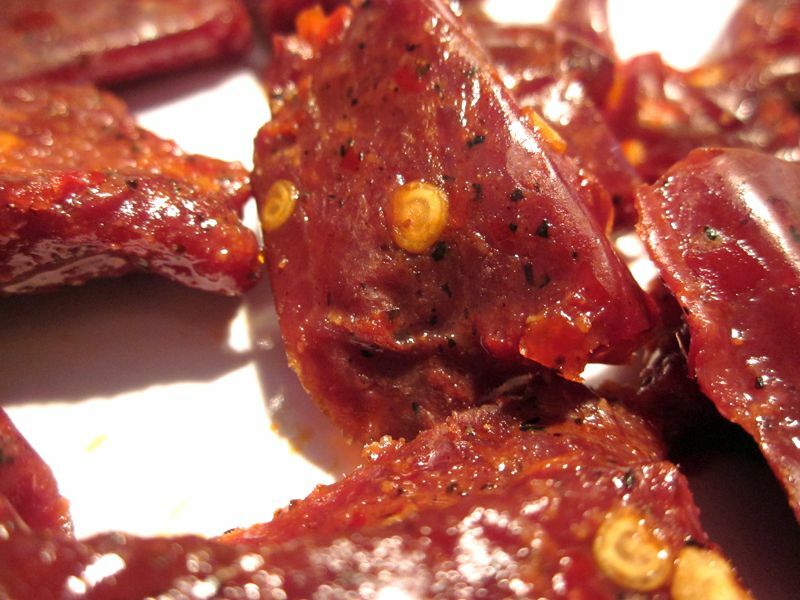 Some of the major brands of hot jerky seem to offer a similar experience for a lower price. 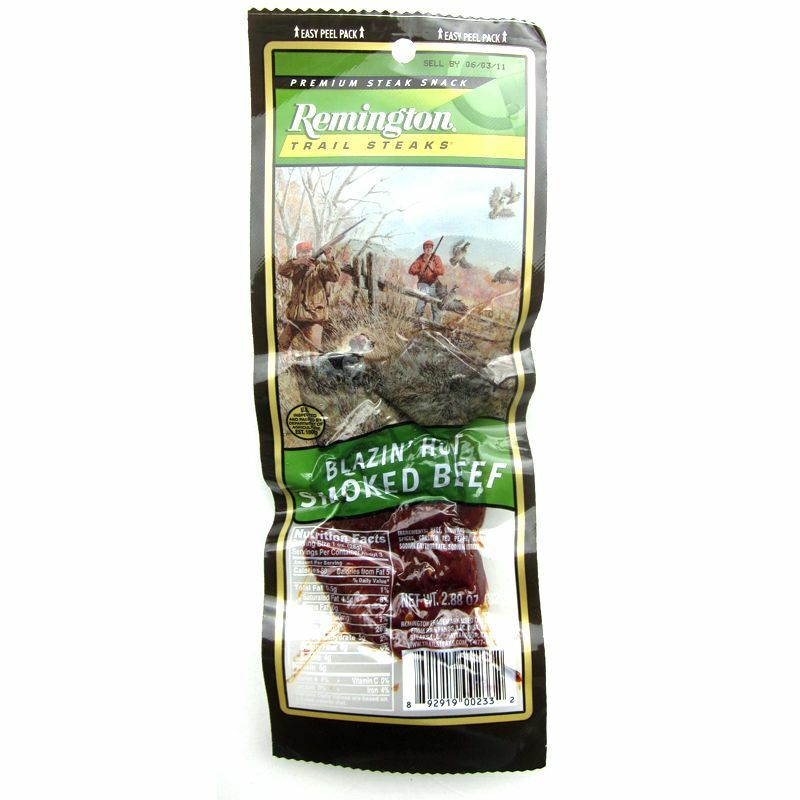 This Blazin' Hot Smoked Beef from Remington Trail Steaks offers a fair amount of heat along with some chile pepper flavor, enough to provide the fiery food lover with the kind of experience they're looking for when buying something labeled as "Blazin' Hot", though clearly this isn't that hot. But even though I'm rating this as "Good", it's only just barely enough to get there. It seems to be above average in that I get a fair amount of chile pepper flavor to go with that medium level of heat, along with some meat flavor, albeit more of a cured meat flavor than a steak flavor. The addition of garlic & onion seasoning, and the light amount of sweet, all seem to contribute to an overall pleasing, enjoyable flavor, while the semi-moist, easy chewing increases the snackability. 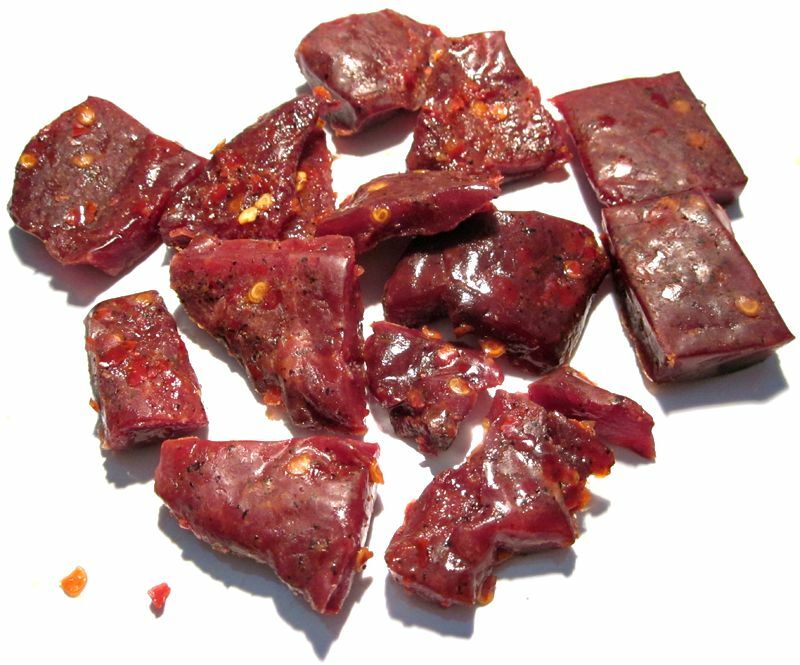 But compared to the gourmet brands of hot beef jerky, particularly with this kind of semi-moist, easy chewing, there's still a part of this that says it's nothing out of the ordinary. 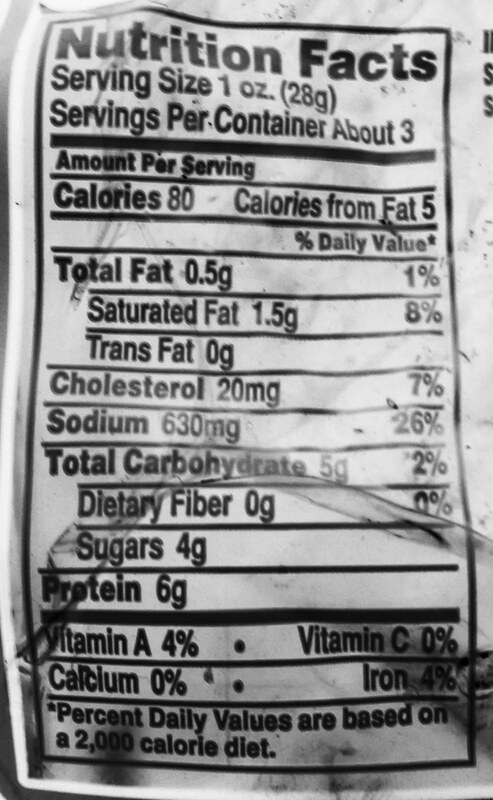 It's only when compared to the major brands of jerky (Jack Links, Oberto, et al) that I find it's above average. My recommended beer pairing for this, I think a dark belgian style ale would work well. Try the Chimay Grand Reserve (Blue) or the Gouden Carolus Noel.